Title page, and p33 of 1922 edition, Cornell copy. I read Sitti Noerbaja ca 1980, both this first and the 1957 (eighth) editions. I observed that footnotes and some other passages that appear in the first edition, are not in the eighth. I’ve not seen mention of the unstable text in criticism of the novel. I wish I’d explored this issue more at the time, and view it as unfinished (personal) business. Sitti Noerbaja is a romance, confused — or impure — in its politics perhaps; certainly interesting in its portrayal of a resolute, impetuous, strong-willed Noerbaja. It’s very good. I recently photographed its pages so that I could read it again, and was struck by the music of its prose, and by the illustrations too. It’s for this reason that I’ve posted all eight of the illustrations on this tumblr blog (for now). This and other instances of early Balai Poestaka fiction, not to mention early sastra liar literature published outside that official channel, are overdue for presentation in digital form. As can be seen from the fuller page view shown above, I’ve cropped the images, and lightened them to retain something of the tempo doeloe (nostalgia, for want of a better term) feel of this aging book. In some instances, I’ve needed to skew images slightly to correct for my uneven photography. Wikipedia has a page on the novel and another on Marah Roesli . 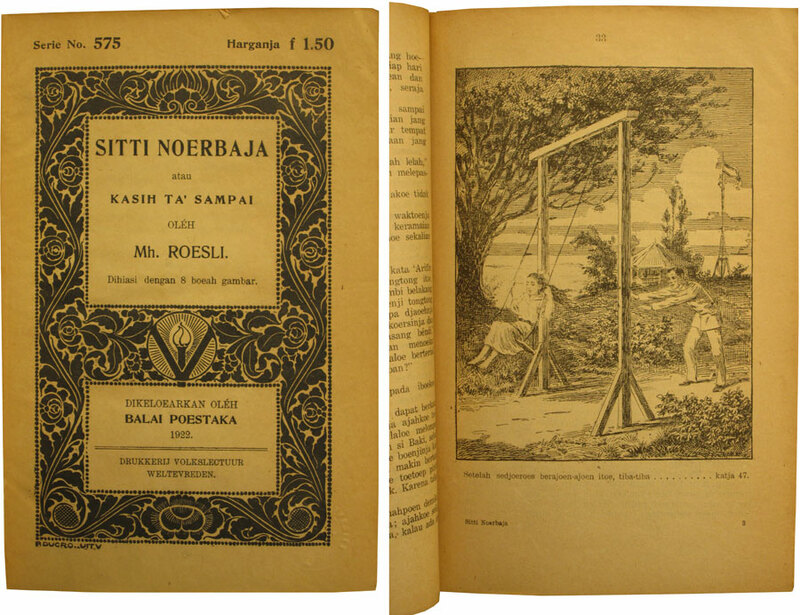 The book was Englished as Sitti Noerbaja: A Love Unrealized by George Fowler, published by the Lontar Foundation in 2011. J. van der Heyden is identified in each image; I presume (but am not certain) that these are by his hand, rather than reworkings for publication, prepared by others from his original drawings. For other work by J. van der Heyden, see KITLV’s image archive, here.